I want to know if I am reading the venn diagram correctly and why there are discrepancies in the diagrams. 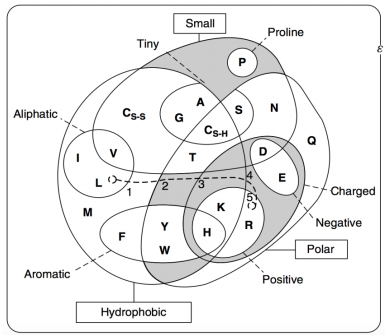 I'm trying to determine which amino acids are considered hydrophobic and I am using this diagram suggested by my teacher from Amino acid properties and consequences of subsitutions. 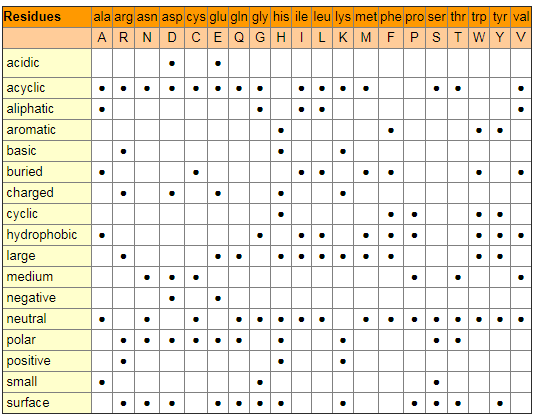 From the diagram I've determined that A, G, C, T, V, I, L, F, W, Y, H, K, M are hydrophobic. 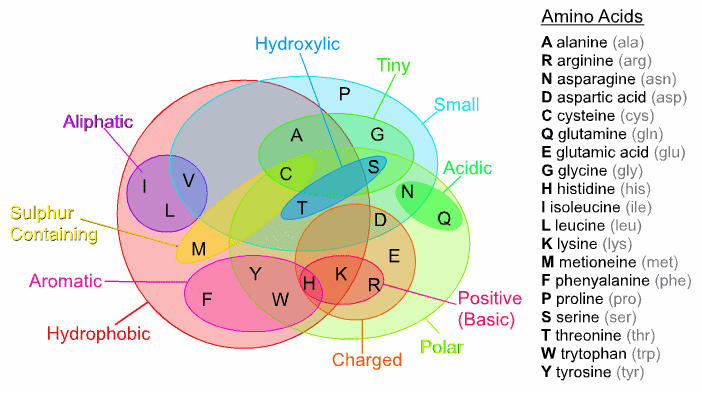 Polarity and hydrophobicity are not discrete phenomena and, therefore, categorizing amino acids as such has some measure of arbitrariness, especially at edge cases. It all depends on one’s definition. Other properties have similar problems. Charge depends on pH. And what is the cut-off between “large” and “medium” sides chains? What is, in my opinion, more important than memorizing charts/diagrams/etc (unless you have an exam) is understanding why different amino acids have these properties. For example, why can threonine or tyrosine be classified as both hydrophobic and polar? Why can cysteine or serine, which are classified as uncharged, act as strong nucleophiles in enzymatic reactions? Not the answer you're looking for? Browse other questions tagged molecular-biology amino-acids or ask your own question. Is there any evolutionary advantage of selection of L-amino acid over D-amino acid? What is the last heavy atom of an amino acid?